Successfully Added Hard Drive Media Player - Portable SATA or IDE Enclosure to your Shopping Cart. SATA or IDE hard disk drive enclosure and media player. Sleek looking HDD (hard disk drive) enclosure that works as a media player or portable storage and includes a built in memory card reader for CF, SD, MMC, and MS cards. This HDD media enclosure is designed to use either ultra fast SATA hard drive or budget friendly IDE hard drive and has multi-format compatibility with digital media, RCA and VGA connections, a USB OTG port for quick uploading of files from such products as digital cameras, and even a 5.1 Channel audio out for connecting it to external speakers. This HDD media player is an excellent way to get your digital files off your computer and play them almost anywhere with superb quality. Hard disk drive enclosure that works as a media player and portable storage. 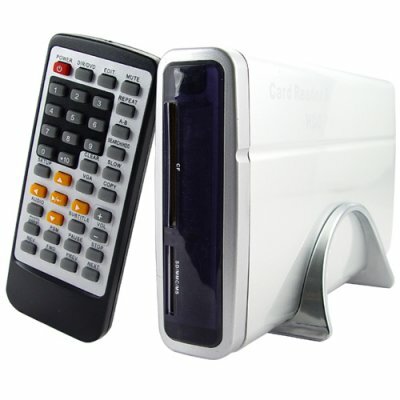 Hard Drive Media Player includes memory card reader for popular card types. Hard disk drive (HDD) NOT included. The HDD you install must be formatted for the enclosure to be able to operate.